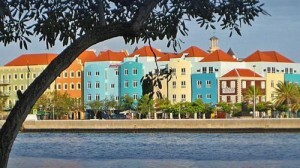 WILLEMSTAD - The betting price for the former Howard Johnson Hotel in Otrobanda was 9.5 million guilders but it was not sold yesterday. According to sources, there was sufficient interest at the notary office Moerdijk & Palm for the auction, but none of the attendees made an offer. It concerns the complex at Brionplein which is from Subway to the red building close to the Breedestraat. It is still unclear if or when the second auction will take place. Landlord Emmazicht has had to deal with tenants who did not meet their obligations in recent years. The rent arrears of the last operator of the hotel, City Hotel, amounted to almost 771,000 guilders until September 4, 2017. City Hotel was declared bankrupt on December 7, 2017. Prior to that, tenant Caribbean Hospitality Management went bankrupt, with a debt of more than 970,000 guilders at Emmazicht.